Watching Lovebites’ rapid ascension and evolution has been such a gripping ride that it’s easy to forget they’ve only been a band for two years. So far, the Tokyo five-piece have been prolific, releasing a self-titled EP, their fiery debut, Awakening From Abyss, and mini-album, Battle Against Damnation, in quick succession. Last year they played the main stage at Bloodstock, not to mention impressing our readers so much that they were crowned the Best New Band at last year’s Golden Gods awards. Formed by bassist Miho in worship of Maiden, Priest and Helloween, Lovebites’ modern take on power and classic metal and technical finesse have made them flag-bearers among a new crop of Japanese metal bands. Now we’ve arrived at album two and what slaps you in the face first is just how fearless everything sounds. Even the title, Clockwork Immortality, feels like a defiant reminder that releasing music at bullet train speed hasn’t been at the expense of artistic growth. 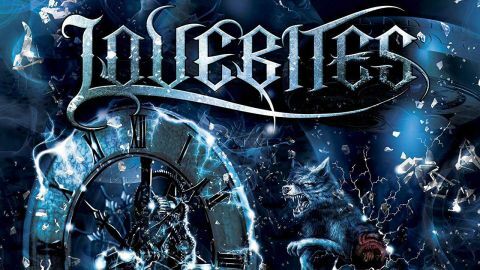 2018’s Battle Against Damnation put Lovebites’ power metal inclinations at the forefront, experimenting with symphonic touches. Clockwork Immortality has seized upon that lavish wizardry, combining technical firepower and the self-aware Maiden idolatry of their debut to take everything to the next level. The presence of Finnish engineers Mikko Karmila and Mika Jussila (Nightwish, Children Of Bodom) on respective mixing and mastering duties ramps things up that little bit more. You can see why the band chose Rising as Clockwork…’s first single. With an exuberant blend of demented Dragonforce-like speeds, duelling solos and histrionic vocals, it’s the best track to showcase where Lovebites are sonically right now, but it’s not the album’s most impressive moment. That honour could go to Mastermind 01, which gallops inon a barrage of neo-thrash splendour.Or Pledge Of The Saviour, which, led by a cracking vocal by singer Asami and a timeless dual riff from shredmasters Midori and Miyami, holds your brain with a grip that’s tighter than Maiden’s leggings in the 80s. M.D.O. is a pure Master Of Puppets-era Metallica adrenaline shot with a gang vocal begging to be accompanied by a field-full of fist punches, held together by lunging bass and Haruna’s exceptional drumming. But time and time again, the blistering twin-guitar assault from Midori and Miyako proves to be Lovebites’ pièce de résistance: a flurry of notes executed with insane precision that piles the drama higher and higher on We The United and the orchestra-led The Final Collision. It’s all tighter than a flea’s arse and there isn’t a bad track here, but even then, the songwriting has improved. While anyone with half an ear could hear Lovebites’ potential on their debut, it did suffer from overblown sonic fatigue by the end. In comparison, each track on Clockwork Immortality stands tall and defiant, brilliantly crafted and memorable in its own right. If Lovebites can achieve this in two years, God only knows where they’ll be in another five – probably being piloted around the skies in their own Ed Force One by some dude called Bruce. But in all seriousness, there’s nothing more exciting than watching everything that’s fun, proficient, ridiculous and downright excellent about metal coming together in the best way possible. Believe the hype, ladies and gentlemen. Lovebites are the full package.